Automotive Software Market size is set to exceed USD 52 billion by 2025; according to a new research report by Global Market Insights, Inc. 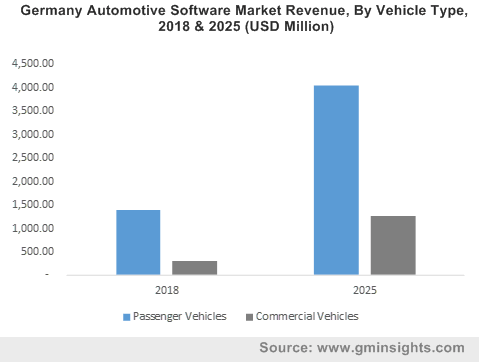 The automotive software market growth is attributed to the emerging automotive landscape, growing demand for safe, efficient, and convenient driving experience, increasing internet penetration, and rising adoption of connected vehicles. In addition, the rising technical advancements, such as AI, blockchain, and AR, and increasing global internet penetration are expected to upgrade the automotive software, which will improve fuel-efficiency, infotainment, functional safety, and streamlined key entry. Automakers and technology giants, such as Audi, BMW, Ford, Google, General Motors, Tesla, Volkswagen, and Volvo, are working on developing their own automotive software. In contrary, consolidation of ECUs and the lack of standard protocols to develop software platforms may adversely affect the overall growth of the automotive software market. Maintenance & troubleshooting of automotive software and cybersecurity threats can create challenges for automotive manufacturers. Moreover, the demand for automotive software is expected to increase significantly over the forecast timeline owing to the growth of the overall automotive industry. The autonomous driving software segment is projected to register an accelerated growth in the automotive software market during the forecast timeline growing at a CAGR of around 17%. The growth is attributed to investments and R&D activities done by companies such as Bosch Software, Wipro, and NVIDIA. In addition, these companies are also taking efforts to expand and emerge with other companies to design & develop autonomous vehicles. For instance, in August 2018, Genesys signed a Memorandum of Understanding (MoU) with Wipro to tap opportunities in the autonomous car industry. As per the MoU, Genesys will develop HD Maps & Content while Wipro will develop the navigational & control technology for autonomous systems and smart mobility companies. Also, in November 2018, Bosch and Daimler partnered to run a test program for automated on-demand ride-hailing service. The on-demand ride-hailing service app would offer an automated driving experience to a selected user community. The passenger vehicles segment shows a promising growth rate during the forecast period. This segment has a wide area of application for automotive software as compared to commercial vehicles. Passenger vehicles with various in-vehicle electronics systems, such as power steering, powertrain, and start-stop systems, contain numerous ECUs that need software programs to work. The trend of integrating smart technologies in passenger vehicles is increasing the number of in-vehicle electronics systems, increasing the number of ECUs, expanding the opportunities for automotive software in the passenger vehicles segment. The manufacturer retail store segment shows the highest growth rate during the forecast period. This segment is influenced by the increasing consumer expectations and dealership franchise dynamics. In addition, the increasing vehicle pricing transparency and consumers, who are equipped to make product comparisons easily are affecting the profit margins of dealers significantly. Therefore, offering the range of automotive software solutions in terms of customization may cure the decreasing profit margins of automotive dealers up to a certain level. The Asia Pacific automotive software market is expected to register the highest growth with a CAGR of around 18% between 2019 and 2025. This growth can be attributed to the presence of emerging countries (such as China and India), leading manufacturers, and significantly large consumption markets in the region. In addition, the infrastructural development and growing industrialization in emerging economies are creating opportunities for automotive OEMs. The companies operating in the global automotive software market are focusing on technology innovations, strategic acquisitions, and mergers to strengthen their market position and acquire new customers. For instance, in January 2018, Bosch acquired a 5% indirect ownership stake from HERE Technologies, a global provider of digital mapping & location services. The acquisition is expected to help Bosch in becoming a global provider of data-based real-time location services to customers both inside and outside the automotive industry. Some of the key players operating in the market are Cox Automotive, CDK Global, SAP, Siemens PLM Software, Nvidia, Bosch Software, Reynolds and Reynolds Company, Dassault Systèmes,, Autodesk, Solera Holdings, Oracle, Ansys Inc., Dealertrack, Wipro Limited, Honda, Genesys, Daimler, Delphi, Ford, and General Motors.